Not only are fungal nails embarrassing, they are the leading reason behind costly visits to the podiatrist and dermatologist. Laser toenail fungus treatment procedures are safe and work effectively without causing any signs of discomfort, in comparison to painful toenail removal surgery and leading prescription topical treatments for toenail fungus. How does Fungus Nail laser treatment work? Fungus nail treatment is a revolutionary means to cure fungal nail infections, in a patient friendly, quick and effective way, utilizing GentleYAG laser light. The laser has no effect on healthy tissue and healthy nail would be visible within weeks. The Laser light heats evenly throughout the depth of the affected nail and skin tissue, effectively weakening and killing the parasitic fungi which have infected the nail. Deep, pulse-profile heating of the nail bed stimulates the killing of parasitic fungus. The natural growth and immune processes of the body are then able to restore the nail to its pristine state. Compared to traditional methods, the effects of laser light spread evenly throughout the tissue and are not subject to either the limits of chemical diffusion, as are topical, or the induction of hepatoxic side effects, as is the case with oral medications. *How soon should I experience results? On average, any toenail replaces itself every 6 to 9 months through natural growth. Healthy new growth may be visible within few months as the new nail replaces the old. However, follow up treatment with an anti-fungal cream with L-arginine has shown an increase in the speed of healthy nail replacement. Your podiatrist may make recommendations for a post laser treatment toenail cream. Most people do not feel any pain. Some patients may experience slight warmth and occasional snapping sensation during the procedure. If you have any pain during the procedure, the laser power may be decreased slightly to reduce any pain. No anesthesia is needed. The amount of time varies on the degree of involvement of the nails. Very thick nails are mechanically reduced to a more normal thickness with specialized equipment. 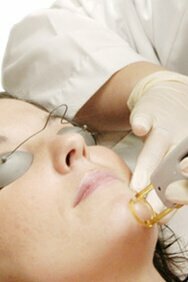 The laser is then applied typically taking only a few minutes.